Historically there are a number of references of strange water animals having been captured or even killed in Ireland. Unfortunately, in none of these recorded instances was the body preserved for any formal examination. This was mostly likely due to the fact that in such areas were the creatures were found the locals had some degree of familiarity with them and therefore did not recognize the greater significance such a specimen would have held for science. It wasn't until the latter half of the 20th century that efforts of a scientific nature were launched in hopes of properly identifying the very creatures allegedly responsible for the lake monster phenomena in Ireland. During the spring of 1968 various members of the Loch Ness Investigation Bureau gathered in Clifden for what would become the first of two attempts at capturing an Irish lough monster. On hand was Dr. Roy P. Mackal, F.W. Holiday and fellow Bureau member Lionel Leslie who'd been actively investigating reports in western Ireland concurrent to his colleagues efforts at Loch Ness. 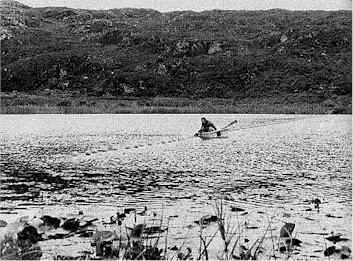 Based upon the testimonies gathered by Leslie, the Bureau became confident that a species similar, if not identical, to the ones pursued in Loch Ness could be found within the significantly smaller bog lakes of Connemara. Attempting to acquire a specimen in loughs a mere fraction the size of Ness naturally appeared far more pragmatic to the team. With a combined arsenal consisting of a fish-stunner, echo-sound technology, mountable cine cameras, a Greener harpoon gun and nets that could expand the width of a small lake, the team originally choose the glacial-carved Lough Shanakeever as their primary hunting grounds. Sightings in Shanakeever dated back at least 30 years based upon what reports Lionel Leslie had collected up to that point. Leslie had obtained the impression from locals that the animals, referred to by some as "horse-eels", were thought to burrow themselves into the mud from which they would lay dormant for considerable durations of time. In light of this local lore one team member made preparations to have gelignite detonated along the shore to function as something of a rude wake up call for any slumbering peistes. Such a proposal may sound a tad extreme, but a previous attempt involving explosives had yielded encouraging results. In 1965 Leslie set off 7 lbs of gelignite along the shore of Lough Fadda after becoming familiar with the 1954 sighting. It was recorded that ten seconds proceeding the blast, a long black object broke the surface and began violently thrashing about. Cameras were on hand but apparently failed to capture the activity before it subsided. Hoping to repeat what might have been previous success, the team was prepared (and legally licensed) to deploy nets and obtain a tissue-sample via a harpoon should anything of interest surface after the blast. Another strategy was to deploy something of a large improvised eel-trap into the lake which was to be baited with fish offal and small eels. The trap was to remain for the summer season while being frequently checked and re-baited. Also on the agenda was for a net to be stretched across the lake as strategic disturbances were deployed in hopes of driving any possible horse-eels toward entanglement. Lough Shanakeever had been chosen for its workable size and the relative consistency of sightings. The previous four summers had all yielded reports. However, at the last moment, plans were altered when word came through that a sighting that had taken place only months prior in the even smaller Lough Nahooin. In some ways the lake's lack of size seemed to push limits on the very definition of the word "lake" as it was only an estimated 250 yards in length by 150 yards in width. Initially the dimensions were viewed with both optimism and skepticism. Sensing opportunity at hand, F.W. Holiday made the comment, "If one's in here, then it's ours". Despite the creative strategies that had been set for trial in Shanakeever, efforts in Nahooin were limited only to placing a net across the lake. Holiday wrote that on one particular morning, several of the net's buoys had sunken from view. What had caused them to submerge was something of a mystery. Keeping alternative explanations in mind, Holiday pondered if a peiste had challenged the blockade during the night. Aside from this indeterminable possibility there was no indication of a lake creature residing in Lough Nahooin for the remaining short amount of time LNIB was present. The lake's dimensions proved too unsettling for most participants, especially Dr. Mackal who wrote "...not even one substantial animal could have more than a transient relation with this little pond, even if one assumed maximum of possible food sources." He continued that it was possible the animals were semi-aquatic as some reports suggested, and therefore at least partially transitory. LNIB may have failed in collecting a specimen but their efforts weren't entirely in vain. During the course of their stay additional witnesses were found and valuable testimony was subsequently recorded. The team came to learn of a local tradition pertaining to an incident from the previous century where a horse-eel had become lodged within a culvert from which it eventually died within. During a visit to the site Dr. Mackal took a measurement of the culvert opening and concluded the animal must have had a diameter of around 17 inches. One year after the Loch Ness Investigation Bureau's unsuccessful expedition to Ireland, four members returned to the bog lands of Connemara for yet another round of effort. This time they planned to take on Lough Shanakeever and Lough Auna in addition to giving Lough Nahooin another shot. The team was significantly smaller than the one prior, consisting only of Ivor Newby, Lionel Leslie, F. W. Holiday and LNIB secretary Holly Arnold. 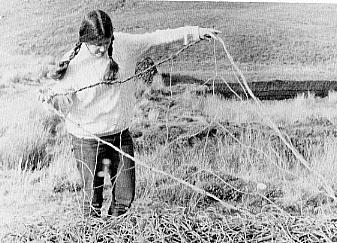 Efforts were broader however, as nets were placed simultaneously in all three lakes. Despite previous disappointment, Lough Nahooin seemed to once again flaunt its potential after Lionel Leslie met with a local farmer who'd had a sighting of a strange creature on the shore of the lake only one month prior. However, this time the net-wall faced complications. Persistent rains had swollen Nahooin, creating permissible gaps along the bottom in areas where the net failed to touch. Additionally, plans to drag the lake with chains were thwarted due to the abundance of snagging lilies. unraveling a net with Lough Shanakeever in the background. The three nets were checked repeatedly and readjusted when needed but at no time did they secure any unknown creatures. Nonetheless the team was keen on conducting their own survey of the families and residences along the lakes to extract what knowledge or experiences they may have had with horse-eels. Holiday wrote that it seemed over half the population either had seen a creature or knew of someone close who had. In July of 1982 Lionel Leslie conducted an expedition of some sort on Lough Derg. Until his unpublished works are recovered somehow the only details available on this particular operation are for the most part limited to a letter he'd submitted with the Irish Times. Sir, --I am writing to let you know the results of a recent expedition to Ireland made by American scientists, in which I took part. These results have now been checked and analyzed. The Academy of Applied Science, Boston, a nonprofit-making establishment formed for the purpose of scientific research and education, carried out a side-scan sonar survey of Lough Derg on the Shannon early October, 1982. The objects were firstly to examine topography bottom; secondly, to collect information of wildlife; and thirdly, search for any signs of large creatures reported recently. The expedition was based at Mounshannon and plans (to?) return in 1983 to carry out underwater strobe camera photograph. In the interests of science, as well as an attraction for tourism, it may be hoped protective measures will be taken on Lough Derg, similar to those in force on Lough Ness. During the operations that were carried out with a cabin cruiser, we were helped by the information given by a local witness James Minogne -known affectionately as Jimmy the Crock -who is remarkably well informed about the lake. Incidentally, I happen to be an expatriate from County Monaghan, and hence my interest. Grasspoint, Isle of Mull, Argyll. The "American scientists" no doubt consisted of Dr. Robert Rines whose perhaps most famous for attaining the "flipper" photo and other well published underwater images associated with the Loch Ness monster. A "search" of some sort was conducted in Lough Fadda during the early 1980s. It at least made a local paper but as for what it entailed and how many participated; well, I didn't take any notes on it when I had the chance. If any readers are familiar with the details surrounding this event please contact me. In June of 2001 Swedish veteran serpent-tracker Jan Sundberg of GUST arrived in Athlone to search for the alleged "Lough Ree Monster". Accompanying him was Espen Samuelson of Norway and myself, at the time stationed in Hawaii. My participation was something of a chance event. Earlier that summer I'd decided to take leave from the military and had been romancing the idea of returning to Ireland for follow-up research. By sheer coincidence Jan emailed me to inform that he was intending on leading an expedition to Lough Ree that very summer. The extent of the expedition centered around frequent excursions out onto semi-secluded spots of the lake where Jan would then deploy his hydrophone into the water as Espen and I kept vigilant watch for any unusual activity. The 'operation' was well publicized receiving second page coverage in the Irish Times and a segment on RTE evening news.